Today, crafters and artisans are making money by selling their handmade crafts and art online thanks to online marketplaces. 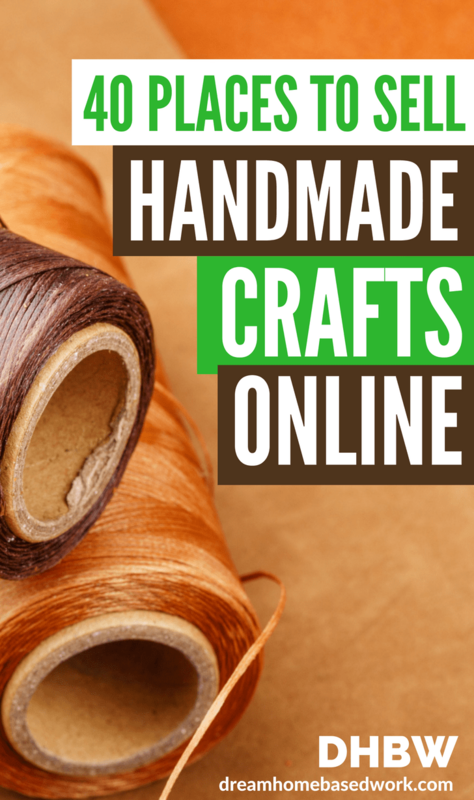 No matter what your handmade crafts or artwork are, you can find at least one marketplace online that is a perfect fit for you, your creations, and your customers. Most sites charge a fixed amount for listing and will take a small percentage of whatever you sell. You can make money selling things you love the most to a global audience. Etsy – Etsy is considered as the biggest creative marketplace online for selling handmade crafts. You can sell absolutely anything that is handmade craft on Etsy. The good news is that Etsy does not charge you any membership fees. The site charges a very small amount to list one item for four months or until it sells. Once your item sells, they take a very small percent fee from the sale price. ArtFire – Artfire is a great online marketplace to sell your handmade crafts. They do not charge you any fees to list your handmade items, but they do charge you a monthly fee for your online store. You can receive payments from your customers via PayPal, Amazon, or ProPay. Shop Handmade – Shop Handmade is a relatively new site where you can list your handmade items to sell online. The good news is that they are completely free to use. There is no fee to list your items. There is no monthly store fee either. You receive payments from customers via PayPal for items sold to them. Hyena Cart – Hyena Cart is a big marketplace online to sell handmade crafts. They do not charge you for listing items, but they do charge you $5 per month for your store providing your store is active. This is a very user-friendly site and a great place for sellers who want sell products that are environmentally friendly and child safe. You Can Make This – You can sell your unique patterns for handmade items using YouCanMakeThis.com. You get 50 percent of the purchase price on each pattern sold. You will list your patterns for sale. You will be paid once a month for your patterns sold. You can also decide whether or not the buyer is required to credit you when they use your pattern or not, and also whether or not they can make your item and then sell it themselves. GLC Arts and Crafts Mall – GLC Arts and Crafts Mall allows you to open your own online store within their site to sell your handmade crafts online. You can open up a store using one of the four plans, ranging in price from free to $12 per month. You can receive payments from your customers via PayPal when your items sell. Amazon Handmade – Amazon recently launched Amazon Handmade that allows crafters to sell their handmade crafts to the Amazon audience online. iCraft – You can sell knit items, jewelry items, and home decor via this global marketplace and gift shop. There is a one-time setup fee of $25. You also choose a monthly selling subscription to sell your handmade items on iCraft Gifts. Made It Myself – It is a free marketplace that allows you to sell your handmade items online. You can create an account for free but pay listing fees and commissions on sales. DaWanda – You can sell your handmade items via this online marketplace. DaWanda has separate sites for English, French, German, Spanish, Italian, and Dutch languages. eCrater – If you are a seller, you can set up your own online store for free on eCrater. You can also import an eBay store into eCrater. Folksy – Folksy is a U.K. based marketplace where you can sell handmade crafts as well as your art. Misi – Misi is a U.K. based marketplace online for selling handmade crafts and art. It lets users set up a shop for free. Sellers are charged small fees for listing their items and commission on each sale. Bonanza – Bonanza allows crafters to list their handmade items and sell them online. It allows the sellers to have their products automatically published to major buying channels like Google shipping. Meylah – Meylah is an e-commerce platform where crafters can sell their handmade products online. iCraft – iCraft is an online marketplace for selling only handmade items. The site offers three different plans ranging from $5 to $15 per month to list and sell your crafts but charges no commission on sales. Shopify – You can set up your own e-commerce shop on Shopify to sell your handmade crafts online. You have complete control over your shop and sell your items yourself. Shopify provides you with everything you need to get your own online shop up and running such as domain name, hosting, professional templates, user-friendly interface, and other tools to manage your shop. You can try Shopify for free for 14 days. eBay – eBay is the largest and greatest online auction site online where people can buy and sell all kinds of different products, including handmade crafts. You can set an auction starting price on your items or choose a “Buy It Now” amount. Selling fees can vary. Aftcra – Aftcra is a place to sell American handmade crafts. It is free to set up a shop on the site and sell your handmade items. Sellers only pay a 7% fee each time an item sells. Articents – This is a very inexpensive marketplace that allows you to make your own storefront to sell your handmade crafts online. They charge only a $5 monthly fee. There are no listing fees or commissions. Self-hosted Site – Crafters can create their own craft store online by having a domain name for their shop or store, secure hosting, and e-commerce functionality. Watch my video tutorial on how to set up a free website on YouTube. If you want to sell your art online, you can take advantage of several online marketplaces or platforms to give as much exposure to your artwork as possible and diversify your potential revenue streams. Which site you should use to sell your artwork online depends on the type of art you are after. Each site has its unique specialties. AbsoluteArts – It is one of the most highly trafficked art sites that offers free to paid memberships to the sellers to sell their art online. Sellers’ bio, portfolio, and shopping cart are displayed on the site. AbstractArtistGallery – This is not a marketplace but this site allows artists to put a link to their sites and drive traffic there. So, it is a great platform to sell your art online via your own site. The site requests donations from artists who use the site to promote their art. AffordableBritishArt – This is a U.K. based site where artists can sell their work without commission fee. There is a charge to have one of the 4 tiered levels account. Amazon – Amazon is a huge marketplace for both crafters and artists to sell handmade art or crafts online. Request an invitation. Altpick – It is a membership site that charges $99 membership fee annually but listings are free. They also offer annual awards to artists. American Handmade Crafts – This site allows the artists to list hundreds of items for sale. Artists pay monthly fees starting at $12. Art.com – This is a highly-ranked e-commerce site where artists can upload images and sell online. Both free and paid levels of membership are available. ArtBoost – This site allows artists to create their own online store or portfolio to display their artwork. They provide a shopping cart too although artists can sell personally to the buyers. Sellers earn 85% of the purchase price of each sale and the site keeps the rest. ArtCollectorMall – The owners of the site invite artists to upload their portfolio for free to sell art online. The site takes a 10% commission once sales are made. ArtFinder – Artists create stores via this site to feature original art that sold online and shipped directly from the artists. Sellers keep up to 70% of the selling price. Payments are managed by the site. ArtFido – This is an Australian based international site where artists can list their art and shoppers buy or bid on art online. The sites takes a 10% commission on each sale made. Benhance – This is a popular online marketplace that allows artists to upload their artwork to an online gallery with a personalized URL. Artists can sell art online using the shopping cart function on the site. A-Z Craze – You can sell you art on this site. You pay a $5 monthly or$50 yearly fee or 5% commission on sales. You pay no listing fees. Society6 – Society6 allows artists to upload their artwork to the site and sell it online. The site takes a portion of earnings from each sale depending on the type of the product. GLC Arts and Crafts Mall – This site offers a variety of monthly plans for artists to sell their art online. Each plan comes with a flat monthly rate. There is no commission or setup fee. Dawanda – Dawanda is a great marketplace online for artisans and crafters to sell their creations. Etsy – Etsy is the largest online marketplace for buying and selling art and other unique products. Artists can set up their own online store on Etsy to sell their art online. DeviantArt – It is a great site for digital artists to sell their digital art online. ArtFire – This is a huge marketplace online that allows you to customize your own shop on the site and sell your artwork. The site charges $20 monthly fee plus 3% commission on sales. Zazzle – Zazzle is a very popular marketplace for buying and selling custom art. It is free and easy to create an account on Zazzle. Art-GalleryWorlwide – You can choose one of the three monthly account options to sell your art online via this platform using their shopping cart. There is set up fee. Each artist gets a homepage to upload their images. All kinds of crafters and artisans can sell their handmade crafts and art online today to earn some extra cash or even a living. If you want to turn your crafting and artistic hobby to money-making opportunity, then you can research the places above to sell your handmade crafts and arts online. Each site has its own rates of fee structure. So, do a little research to find out which one best works for you and your products. Also, be sure to promote your items using social media, especially Pinterest. Always link back to your crafts and art so your followers and others interested in your items can purchase them. Each site has its own rates of fee structure. So, do a little research to find out which one best works for you and your products. Also, be sure to promote your items using social media, especially Pinterest. Always link back to your crafts and art so your followers and others interested in your items can purchase them. This post is a God sent! Thanks Shay. I ‘m a newbie blogger but also spend my spare time painting and was looking into ways to sell my art (at the suggestion of some friends). Thanks for all these options. It makes my research process so much easier.